If awards were given for perseverance, dedication and wholehearted commitment to the cause then Wolf Alice would undoubtedly be among the front runners. Since the current line-up got together four years ago theirs has been a relentless schedule of touring that's seen them play just about anywhere and everywhere over the ensuing period. Indeed, it would probably be fair to say that word of mouth emanating from their admittedly impressive live shows has contributed towards their unassailable rise as one of the UK's biggest rock bands as much as the band's radio or online presence. Certainly as far as yours truly's concerned, 2014's support slots on the Manic Street Preachers' Futurology tour were an eye opener at how far they'd progressed in such a short space of time even then. Little more than six months earlier I'd witnessed them nervously open for Swim Deep and while it was evident the songs were there, the live show was still in need of basic refining at that point. So it's to their credit they've blossomed into one of the finest guitar bands around. 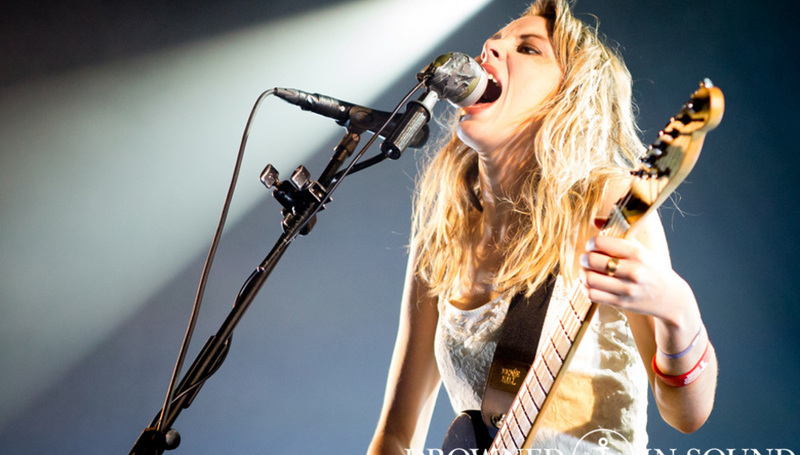 What's also worth mentioning is that while lead vocalist and guitar player Ellie Rowsell might be a focal point of sorts, Wolf Alice are definitely more about the sum of their parts than any one individual. Standing either side of Rowsell are the deadly duo of guitarist Joff Oddie and bass player Theo Ellis. While behind them, drummer Joel Amey cuts a livewire presence throughout every show, more often than not culminating in him diving headlong into the audience at the finale. Last year's critically acclaimed debut My Love Is Cool may have taken a long time coming but a number two chart placing, sales figures currently boasting silver BPI status and prestigious nominations for the likes of the Brit Awards, Grammies and Mercury Prize (not to mention being handed the AIM Breakthrough gong by DiS' editor at the Independent Music Awards) have reaffirmed their position as the British band most likely to ascend to the next level. Certainly if ticket sales for this tour are anything to go by; tonight's show at Nottingham's Rock City was long sold out; they're destined for arenas any time soon. Which is a far cry from their first venture to the city three years ago when they played to a 3/4 full venue in the homely confines of the Bodega half a mile across town. Nevertheless, subsequent visits have seen them headline the same stage at 2014's Dot To Dot Festival while last year's show at the Rescue Rooms also sold out in advance, so the next inevitable step up on the ladder was always going to be this 2100 capacity venue. Somewhat ironically, the tables have turned in that the aforementioned Swim Deep are the main support on this tour having seen their own progress stall between 2013's debut Where The Heaven Are We and last year's ambitious if slightly understated follow-up Mothers. Currently undergoing something of a reinvention of their own, Swim Deep's half hour set actually works as a solid warm-up for the main event. While both 'King City' and 'She Changes The Weather' for the first record are welcome inclusions in the set, it's epic psychrave closer 'Fueiho Boogie' that steals the show. Nevertheless, it's the headliners people are here to see, and Wolf Alice are a band at an ever increasing pinnacle at present. Having started out six years ago initially as an acoustic duo for Rowsell and Oddie, even they probably couldn't have envisaged such a phenomenal rise when debut single 'Wednesday' dropped later that same year. Now long forgotten and seemingly disowned by the band, it's a very different animal to the one that stands before us this evening. The current live set hasn't really changed that much in the past year. Garnered from the album and preceding EPs, it still sounds refreshing without ever becoming too predictable. So when drummer Amey counts in the chorus to 'You're A Germ' and Rowsell screams the middle eight in 'Fluffy' with as much vitriolic bile as went into writing the song, they're incendiary moments in a rip roaring set. More refined moments such as 'The Wonderwhy' and 'Blush' during the encore prove soothing in comparison while 'Moaning Lisa Smile' and 'Giant Peach' - the latter complete with the now familiar synchronised ZZ Top style dance routine - bring both parts of the show to a resounding end. Perhaps the only criticism that could be levelled at Wolf Alice this evening is a lack of any new material. But then for a band who've seemingly been on the road forever, it's difficult to imagine when they'd find time to write any new songs. Instead, this evening is about the here and now, and Wolf Alice are most definitely at the forefront of the present and gathering momentum with every passing show. Triumphant, all conquering and seemingly invincible at this moment in time. The phenomenal rise of Wolf Alice shows no sign of stopping any time soon. Enjoy the ride. Photo by Mike Hughes - see the full gallery from Manchester here.